The song cache includes a wide range of recognizable, simple tunes (“Twinkle Twinkle Little Star”, “O Christmas Tree”, etc.) that also spans the globe (Mexico, Japan, Russia, etc. ), so just about anyone can recognize a few tunes. Various musical genres (jazz, Hawaiian, etc.) enhance worldwide inclusion even more. Widely popular songs include “Every Breath You Take” by The Police, “Material Girl” by Madonna, “The Entertainer” by Billy Joel and “Woman” by John Lennon. Other song standards include “Daydream Believer” by The Monkees, “I’ll Be There” by The Jackson 5, “Please Mr. Postman” by The Marvelettes and “The Loco-Motion” by Little Eva. 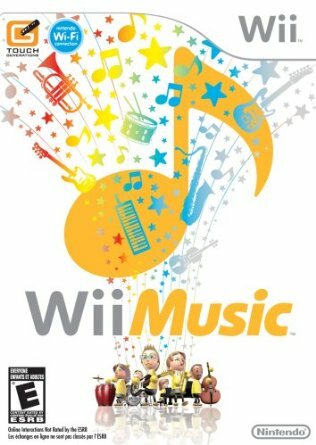 Wii Music also includes numerous arrangements and symphonies by Tchaikovsky, Beethoven, Mozart and Strauss plus pieces from Carmen and the Chariots of Fire theme. Developers also had Nintendo game music from Animal Crossing, Mario, Zelda and even F-Zero. You can always improvise, modify and create your own song arrangements any time, which creates endless results. The endless game play and expansion possibilities, plus an infinite amount of future songs, put replay value through the roof. The custom jam and learning elements create a unique, worthwhile title that represents all music genres extremely well. A well constructed, challenging game that breaks away from other music titles in the ever-growing music game genre. It’s great that you don’t need to spend extra money buying peripherals and setting up the balance board for the drum takes a minimal amount of time. This game might bring back music class memories while creating challenges that might even lead to some real lessons and overall music discovery worldwide. This entry was posted in Video Game Reviews and tagged Games, Michael Siebenaler, Mike Siebenaler, Tall Writer, video games, Wii Music. Bookmark the permalink.